India vs New Zealand, 3rd T20I: While chasing the target of 213 runs, India did not enjoy the most sensational of starts as Shikhar Dhawan (5) fell prey to Mitchell Santner in the first over. Santner struck again in the 9th over removing the threat of Vijay Shankar who had piled 43 runs off just 28 balls before getting dismissed. 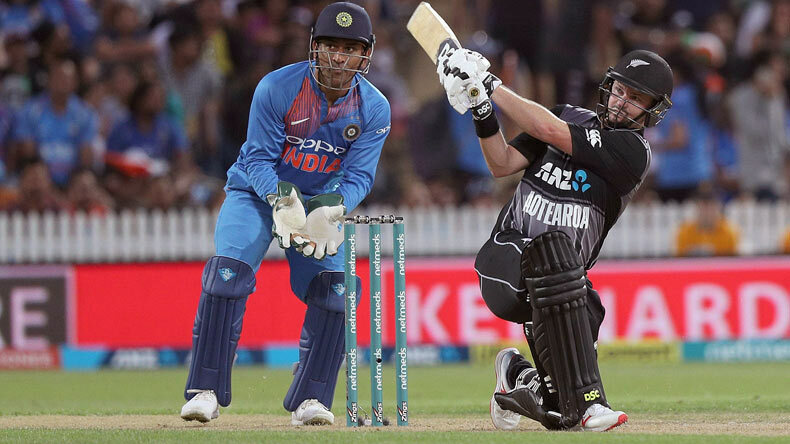 India vs New Zealand, 3rd T20I: New Zealand earned a narrow 4-run victory over India on Sunday in the third and final Twenty 20 International (T20I) match at Seddon Park, Hamilton. With the spectacular win, the home side won the 3-match T20I series 2-1. Colin Munro was named Man of the Match for his 40-ball effort of 72 runs while Tim Seifert was honoured with Man of the Series award for his all-round performances in the series, notably his blistering knock in the first T20I. India’s stand-in skipper Rohit Sharma won the toss and elected to bowl first but that decision backfired early in the match as the Kiwi batsmen started wreaking havoc on Indian bowlers. Tim Seifert (43) and Colin Munro (72) were in fine nick and gave an explosive start to the Black Caps. Skipper Kane Williamson (27) and Colin de Grandhomme (30) further helped their side to put up a monumental total. Daryl Mitchell (19) and Ross Taylor (14) were unbeaten at the crease when New Zealand ended their innings at 212/4 after 20 overs. All the Indian bowlers were hit everywhere around the park by New Zealand batsmen. Kuldeep Yadav was the most successful of the lot as he bagged two wickets at the expense of 26 runs. Bhuvneshwar Kumar and Khaleel Ahmed bagged a wicket each. While chasing the target of 213 runs, India did not enjoy the most sensational of starts as Shikhar Dhawan (5) fell prey to Mitchell Santner in the first over. Santner struck again in the 9th over removing the threat of Vijay Shankar who had piled 43 runs off just 28 balls before getting dismissed. Rishabh Pant (28) tried to hold the fort with Rohit Sharma (38) but both the set batsmen went back to pavilion in quick succession. Hardik Pandya (21) made a good contribution while MS Dhoni (2) had to return back to the pavilion on a cheap score after failing to read a superb delivery by Daryl Mitchell. Dinesh Karthik (33) made a Herculean effort along with Krunal Pandya (26) but both the batsmen just couldn’t get the sinking Indian ship to the bay. Daryl Mitchell and Mitchell Santner bagged two wickets apiece while Scott Kuggeleijn and Blair Tickner dismissed one India batsman each. With the scintillating victory, New Zealand ended India’s series-winning streak and clinched the 3-match T20I series 2-1.